In the UK we have a product called Marmite. It is a deeply divisive food, which you either love or hate. Those who love it, cannot understand how anyone could live without it – and of course, the opposite is true for those who hate it! This sentiment could be applied to volume as a trading indicator. In other words, you are likely to fall into one of two camps. You either believe it works, or you don’t. It really is that simple. There is no halfway house here! I make no bones about the fact that I believe I was lucky in starting my own trading journey using volume. To me it just made sense, and the logic of what it revealed was inescapable. And for me, the most powerful reason is very simple. Volume is a rare commodity in trading because it is a leading indicator. The second, and only other leading indicator, is price. As traders, investors or speculators, all we are trying to do is to anticipate where the market is heading next. So is there any better way than to use the only two leading indicators we have at our disposal, namely volume and price? In isolation each tells us very little. After all, volume is just that, no more no less. A price is a price. However, combine these two forces together, and the result is a powerful analytical approach to anticipating market direction. 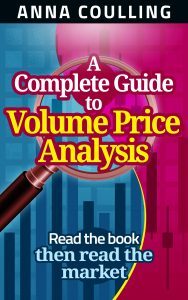 However, as I say at the start of the book, there is nothing new in trading, as the analysis of volume has been around for over 100 years. After all, this is where the iconic traders started. Traders such as Charles Dow, Jesse Livermore, Richard Wyckoff, and Richard Ney. All they had was the ticker tape, from which they read the price, and the number of shares traded. In other words, Volume Price Analysis (VPA), short and simple. This is just one of the many hundreds of emails I have received since writing the book, and you can read more on Amazon where it is a number one best seller.